Now that you’ve been called to the bar and want to begin practice, you likely have questions about insurance and how to apply for it. You will receive an email from us with instructions on how to register a few weeks after your call. Visit the New Lawyer Resources page at practicepro.ca for resources, precedents and checklists to help you take steps to avoid a legal malpractice claim. LAWPRO is the insurance company chosen by the Law Society of Ontario to provide the mandatory professional indemnity insurance for Ontario lawyers in private practice. The insurance coverage provided by LAWPRO supports the interests of consumers of legal services who may have a legitimate malpractice claim against a lawyer and are hoping there will be funds available to provide a settlement or to satisfy a judgment. Professional liability insurance helps lawyers bear the costs of defending themselves against a malpractice claim and covering liability for a client’s loss. Only lawyers in private practice are subject to the mandatory insurance requirement. Do all lawyers have to purchase professional liability insurance? 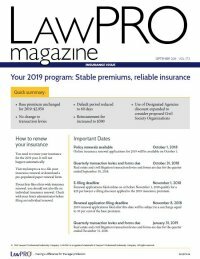 If you are engaged in private practice in Ontario, you must purchase insurance coverage through LAWPRO. If you are not in private practice and meet certain criteria, you are likely exempt from the mandatory insurance requirement. Private practice is the delivery of professional services (including advice) to anybody who is not the lawyer’s employer (see below if you’ll be employed in-house). In general, lawyers in private practice perform professional services for clients for pay. This could be as a sole practitioner or joining a firm. Providing legal advice or help to family or friends, or providing free legal advice to pro bono clients also falls within the definition of private practice. Coverage is $1 million per claim/$2 million in the aggregate, so you and your clients can have the peace of mind of knowing that coverage is available to you in the event of an error or omission in your professional services. The maximum premium discount for Restricted Area of Practice, Part-Time Practice options and the New Lawyer discount combined cannot exceed 50% of the base premium. Can I practise right after I’m called? New lawyers can apply at any time after receiving a Law Society number from the Law Society of Ontario. While it’s important to apply promptly for insurance, you do not need to delay beginning to practise. You can begin the practice of law immediately while you wait to receive your number, with one exception: if you intend to practise real estate law, you must wait until your compulsory Real Estate Practice Coverage Option is in place to do so. To get started, complete an Insurance Application For New Applicants. If you are joining a law firm, talk to your office manager/administrator before completing your application to assist you in completing Section C – Coverage Options and Section D – Premium Options of the Application. If you are establishing a new law firm as a sole practitioner file as an individual. LAWPRO will assign a firm account number to your new firm after receiving your application. If you are establishing a new law firm with other lawyers, indicate the name of your law firm in your application to identify the other lawyers with whom you will be associated. A firm account number will be assigned to you. I won’t be going into private practice. I’ll be in-house, a government lawyer, in a legal aid clinic or not practising at all. Certain categories of lawyers can apply to exempt themselves from paying the professional liability insurance premium. If you are in-house corporate counsel, a government lawyer, working in a legal aid clinic or not currently practising you may qualify for exemption. See each page for the eligibility requirements of each category and to apply. What coverage do I have? Lawyers in this category of exemption have a maximum of $250,000 per claim/in the aggregate Run-off coverage for claims brought against them for professional services while in private practice. If you are claiming exemption immediately after being called, you would of course not have performed these services. There is no premium for lawyers exempt under this category. You must file an Application for Exemption.